Microgaming Kung Fu Monkey Review - Play Kung Fu Money at Casinos Here! Kung Fu Monkey is set in Chinatown. The introductory clip shows the Kung Fu monkey in Chinatown searching for the baby who has been kidnapped by a set of evil looking apes. These characters are represented on the reels. The Kung Fu Monkey and the Baby are important symbols. The kidnappers are represented by Big Boss Gorilla, the Baboon and the Ninja Monkey. Other characters include Female with Fan, Female with Drum and Old Man. The reels are set in the background of Chinatown. The complete styling of the slot game, including the fonts, is done in Chinese style. The music has a fast tempo in keeping with the martial arts theme. 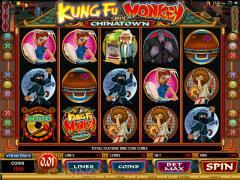 The Kung Fu Monkey online slot game has excellent animations. All the symbols get animated when in winning combinations. The Ninja Monkey brandishes his sword; the Female with Drum starts beating it; the Big Boss Gorilla swipes with his clenched fists and the Suitcase opens up to reveal a stash of gold coins. 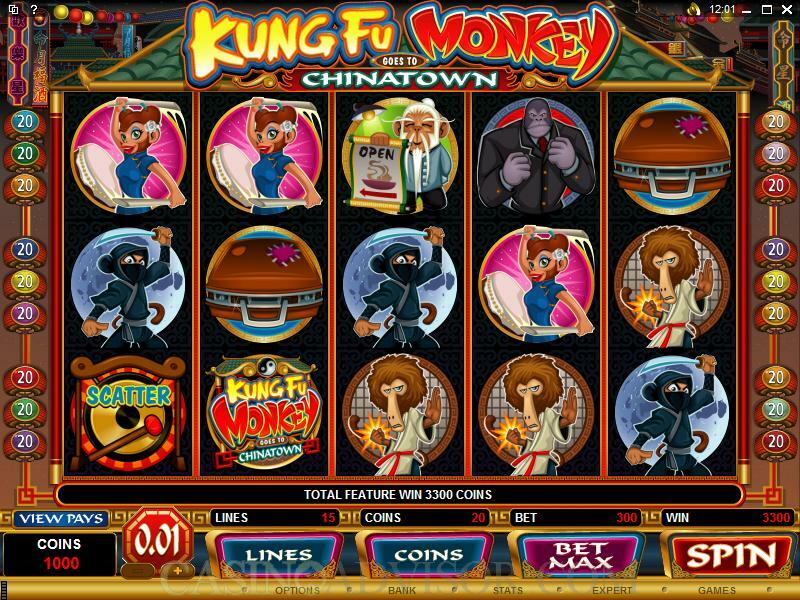 Kung Fu Monkey allows players to manipulate all three betting options. The slot has 15 paylines. Players can wager up to 20 coins per payline. The coin denominations range is also quite large. The following coin sizes can be wagered: 0.01, 0.02, 0.05, 0.10, 0.20, 0.25 and 0.50. The appropriate selection can be made using the buttons provided below the reels. The Kung Fu Monkey Logo is the wild symbol. It does not multiply payouts but it offers the largest fixed jackpot of 2500 coins when five of these symbols appear in an enabled payline. The slot game has two scatter symbols. The Chinatown scatter symbol appears only on reels 2, 3 and 4 and triggers the Kung Fu bonus round. The Gong scatter symbol appears only on reels 1 and 5 and triggers the free spins bonus round. In normal spins both of these bonus rounds can be triggered simultaneously. However, the Kung Fu bonus round cannot be triggered during free spins. When each set of the scatter symbols appear on their respective reels they payout 1x the total bet. The Gong scatter symbol offers 10 free spins at double the payouts. The free spins can be re-triggered. The Kung Fu bonus round is a three level game on the second screen. 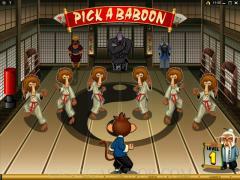 In level 1 the Kung Fu monkey faces up with six baboons. He has to pick three of them. Five of the baboons can be defeated. 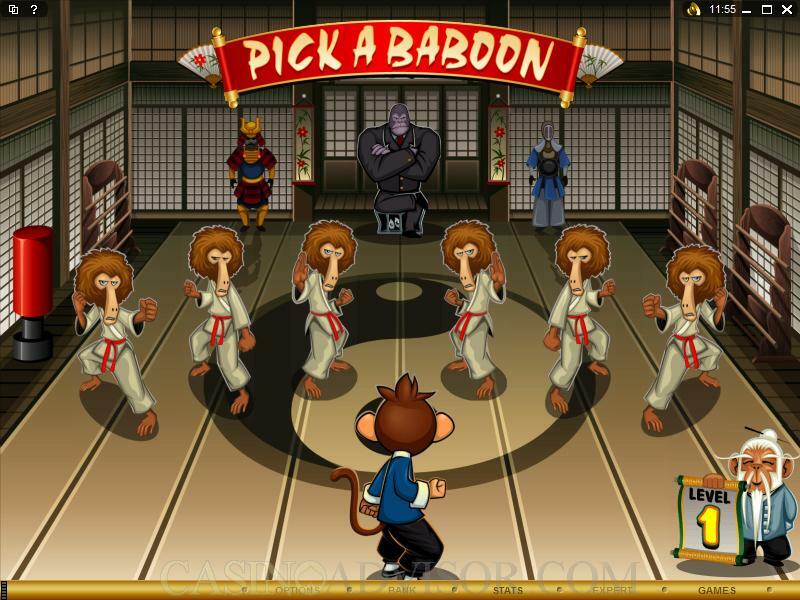 However if the player picks the sixth baboon then the game terminates but with a number of free spins awarded. In level 2 the Kung Fu monkey faces six ninjas. The game is played exactly in the same manner as in level 1. In level 3 the Kung Fu monkey fights the Big Boss. The player has to choose the combo. Picking the correct combo twice defeats the Big Boss. The Kung Fu monkey frees the baby and the player wins big rewards. Interested in reading more detailed information about Kung Fu Monkey? If so Click Here for more details.